Scattered thunderstorms. High 64F. Winds SE at 10 to 20 mph. Chance of rain 50%..
Thunderstorms during the evening will give way to cloudy skies after midnight. Low 48F. Winds SW at 10 to 20 mph. Chance of rain 80%. Janesville, WI -- Doris B. Fischer, age 78, of Janesville, passed away peacefully on Wednesday, December 26, 2018, at St. Mary's Hospital in Madison. She was born in Pforzheim, Germany on July 25, 1940, the daughter of the late Helmut and Erna (Frey) Schwmmle. Doris met her husband, John Fischer, while he was stationed in Germany serving in the United States Army. She moved to America in 1965, and John and Doris were wed on December 18, 1965, in Beloit, WI. Doris worked for Seneca Foods for many years. She loved the outdoors, camping, hiking, traveling, and gardening. Doris was a loving wife, mother, grandmother, great-grandmother, she will always be remembered for her devotion to her family. 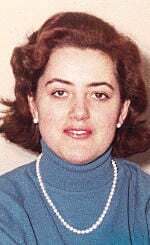 Doris is survived by her husband, John; daughters, Jean (Ken) Ackerman and Jane (Dave) Danekas; five grandchildren: Rodney (Jenny) Ballmer, Garrett Ballmer, Jesse (Jessica) Logue, Jeremy and Nathan Danekas; six great-grandchildren: Lillie Vorce-Ballmer, Ava and Ella Ballmer, Paige, Kaiden and McKenzie Danekas; and her special cousin, Inge in Germany. Doris is predeceased by her mother-in-law, Margaret Schiller; father-in-law, Joseph (Sally) Fischer; and her grandson, Kenneth Danekas. Doris' family would like to thank Fr. Pat, the staff of St. Mary's Hospital in Madison, and all of the volunteers with the "No One Dies Alone" Program, for all of their compassion and caring through her passing.